Real Steel is a 2011 American science fiction sports film starring Hugh Jackman and Dakota Goyo and co-produced and directed by Shawn Levy for DreamWorks Pictures. The film is based on the short story "Steel", written by Richard Matheson, which was originally published in the May 1956 edition of The Magazine of Fantasy & Science Fiction, and later adapted into a 1963 Twilight Zone episode. 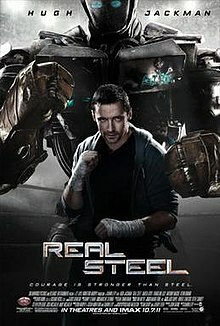 Real Steel was in development for several years before production began on June 24, 2010. Filming took place primarily in the U.S. state of Michigan. Animatronic robots were built for the film, and motion capture technology was used to depict the brawling of computer-generated robots and animatronics. Real Steel was released by Touchstone Pictures in Australia on October 6, 2011, and by Walt Disney Studios Motion Pictures in the United States and Canada on October 7, 2011, grossing nearly $300 million at the box office. It received mixed reviews, with criticism for the formulaic nature of the plot and the fact that elements remained unresolved or were predictable, but also praise for the visual effects, action sequences and acting performances. The film was nominated for the Academy Award for Best Visual Effects at the 84th Academy Awards, but lost to Hugo. In 2020, human boxers are replaced by robots. Charlie Kenton, a former boxer, owns "Ambush", but loses it in a fight against a bull belonging to promoter and carnival owner Ricky, who rigged the fight to mess with Charlie as he sees him as a joke, partially because he beat him up the last time they competed for bailing on the bet. Having made a bet that Ambush would win as a result, Charlie now has a debt to Ricky that he can't pay—which he runs out on. After the fight, Charlie learns that his ex-girlfriend died and he must attend a hearing deciding the future of their son, Max Kenton, whom Charlie has had almost zero contact with and complete apathy towards since he was born. There, Max's aunt, Debra, and her wealthy husband, Marvin, request full custody, which Charlie concedes for $100,000, half in advance, on the condition that Charlie retains Max for three months while they are on vacation and the other half when they return. Thereupon, Charlie, Max, and Bailey Tallet, the daughter of Charlie's former boxing coach, acquire the once-famous "Noisy Boy", but it is destroyed in a subsequent fight against "Midas". As he and Charlie attempt to scavenge parts to make a new robot from a junkyard, Max discovers "Atom", an obsolete but intact sparring robot designed to withstand severe damage, that is capable of mirroring opponent and handler movements and storing them in its memory due to its rare "shadow function". At Max's behest, Charlie pits Atom against "Metro", whom Atom overcomes. Max programs Noisy Boy's vocal-respond controls in Atom, and convinces Charlie to help him with Atom's fighting move memory, resulting in a series of victories and culminating to being offered a fight in World Robot Boxing against national champion "Twin Cities". After reaching the arena, the owner of global champion "Zeus" offers to buy Atom, which Max instantly rejects. Charlie disagrees, but eventually takes Max's side. The fight starts with Atom on the attack, but Twin Cities easily takes the offensive and corners Atom. While their opponent has no blind spot, Charlie notices a hitch whenever Twin Cities throws a right jab. Using this, Charlie is able to get Atom out of the corner and eventually win by knockout. Elated by their success, Max challenges Zeus, publicly, with the audience squarely on their side. After the fight, Ricky and his two henchmen ambush Charlie for bailing earlier and rob them of their winnings, prompting Charlie to return Max to Debra. This upsets Max, and when Charlie tries convincing him it is better for Max to live without him, Max says he always wanted Charlie to fight for him and be there as a father. After Max leaves, Charlie returns to Bailey. While talking with her about the events, the two kiss, revealing their attraction to each other. Persuaded by Bailey, Charlie arranges the challenge offered by Max and convinces Debra to allow Max to witness the fight. Zeus starts the fight by knocking Atom down with its first punch, but Atom gets up, and Zeus continues its assault, knocking Atom down multiple times. However, each time Atom gets back up, and eventually is able to land its first punch allowing Atom to survive the first round. Ricky, who had made a bet with a friend of Charlie's of $100,000 that Atom would not last the round, tries to slip away, but is cornered by the fight's bookmakers. The fight continues with Atom landing multiple punches but also getting knocked down many times and recovering each time. Late in the fourth round, Atom's vocal-respond controls are damaged, forcing Charlie to use its visual "shadow function" to make it visually mimic his boxing skills. This, and the fact that Zeus starts running out of power from its constant offense, tip the odds in Atom's favor, forcing Zeus' programmer to manually control it, and Max and Bailey both watch Charlie doing what he was meant to do, and are touched by seeing him literally fighting for his son. Zeus gets a sound beating, once even hitting the ground and barely avoiding losing by knockout, but survives the final round and wins the match by the judges' decision. The technologically superior machine remains undefeated, although with the humiliation of being fought to a near-loss, and Atom is hailed as the "People's Champion". Based on Richard Matheson's 1956 short story "Steel." The original screenplay was written by Dan Gilroy and was purchased by DreamWorks for $850,000 in 2003 or 2005 (sources differ). The project was one of 17 that DreamWorks took from Paramount Pictures when they split in 2008. Director Peter Berg expressed interest in the project in mid-2009 but went no further. Levy was attached to the project in September 2009, and Jackman was cast in the starring role in November for a $9 million fee. In the same month, Steven Spielberg and Stacey Snider at DreamWorks greenlit the project. Les Bohem and Jeremy Leven had worked on Gilroy's screenplay, but in 2009 John Gatins was working on a new draft. When Levy joined the project, he worked with Gatins to revise the screenplay, spending a total of six weeks fine-tuning the script. Advertising company FIVE33 did a two-hundred page "bible" about robot boxing. Levy said he was invited by Spielberg and Snider while finishing Date Night, and while the director initially considered Real Steel to have "a crazy premise," he accepted after reading the script and feeling it could be "a really humanistic sports drama." Real Steel had a production budget of $110 million. Levy chose to set the film in state fairs and other "old-fashioned" Americana settings that would exude nostalgia and create a warm tone for the film's father-son story. There was also an attempt for the scenery to blend in new and old technology. Filming began in June 2010, and ended by October 15, 2010. Locations include areas around Detroit, Michigan, and across the state, including at the Renaissance Center, the Cobo Arena, the Detroit Fire Department headquarters, the Russell Industrial Center, the Ingham County Courthouse in Mason, Michigan, the Leslie Michigan Railroad Depot, the former Belle Isle Zoo, and the Highland Park Ford Plant. Jason Matthews of Legacy Effects, successor to Stan Winston Studios, was hired to turn production designer Tom Meyer's robot designs into practical animatronic props. He said, "We have 26-and-a-half total live-action robots that were made for this film. They all have hydraulic neck controls. Atom has RC [radio-controlled] hands as well." According to Jackman, executive producer Spielberg "actually said to Shawn, 'You should really have real elements where you can.' ... Basically if they're not walking or fighting, that's a real robot." Levy added that Spielberg gave the example of Jurassic Park, where Winston's animatronic dinosaurs "got a better performance from the actors, as they were seeing something real, and gave the visual effects team an idea of what it would look like." As Real Steel was not based on a toy, Meyer said that "there was no guideline" for the robots, and each was designed from scratch, with an attempt to put "different personality and aesthetics," according to Levy. In Atom's case, it tried to have a more humanizing design to be an "everyman" who could attract the audience's sympathy and serve as a proxy to the viewer, with a fencing mask that Meyer explained served to show "his identity was a bit hidden, so you have to work harder to get to see him." Executive producer Robert Zemeckis added that the mask "became a screen so we can project what we want on Atom's face." Damage was added to the robots' decoration to show how they were machines worn out by intense battles. For scenes when computer-generated robots brawl, "simulcam" motion capture technology, developed for the film Avatar, was used. As Levy described the process, "[Y]ou're not only capturing the fighting of live human fighters, but you're able to take that and see it converted to [CGI] robots on a screen instantaneously. Simulcam puts the robots in the ring in real time, so you are operating your shots to the fight, whereas even three, four years ago, you used to operate to empty frames, just guessing at what stuff was going to look like." Boxing hall-of-famer Sugar Ray Leonard was an adviser for these scenes and gave Jackman boxing lessons so his moves would be more natural. Real Steel had its world premiere on September 6, 2011, in Paris at the Le Grand Rex. The film had its United States premiere on October 2, 2011, in Los Angeles at the Gibson Amphitheatre. It was commercially released in Australia on October 6, 2011, followed by the United States and Canada on October 7, 2011. Its U.S. release, by Walt Disney Studios Motion Pictures, was originally scheduled for November 18, 2011, but it was moved earlier to avoid competition with the first part of The Twilight Saga: Breaking Dawn. The film was released in 3,440 theaters in the United States and Canada, including 270 IMAX screenings. There were also over 100 IMAX screenings in territories outside the United States and Canada, with 62 screenings on October 7. DreamWorks released the first trailer for Real Steel in December 2010 and was attached to Tron: Legacy. In May 2011, DreamWorks released a second trailer. While the film features boxing robots, Levy said he wanted to show in the trailer "the father-son drama, the emotion Americana of it". He said, "We are very much the robo-boxing movie, but that's one piece of a broader spectrum." In addition to marketing trailers and posters, DreamWorks enlisted the British advertising company Five33 to build large physical displays representing the film as it had done for Pirates of the Caribbean: On Stranger Tides. The studio also collaborated with Virgin America to name one of their Airbus A320s after the film, and one of the film's robots is pictured on its fuselage. On September 19, Jackman appeared on the weekly sports entertainment program WWE Raw to promote the film. In addition to Jackman making an appearance on the show, WWE named Crystal Method's "Make Some Noise" from the film's soundtrack as the official theme song for their returning PPV, Vengeance. Jakks Pacific released a toy line with action figures based on Atom, Zeus, Noisy Boy, Midas and Twin Cities. The company has also released a one-on-one, playset fighting game with robots in a ring. ThreeA released a line of high-end sixth-scale figures, as adapted by Australian artist Ashley Wood, based on Ambush, Atom, Midas, and Noisy Boy. Jump Games released a fighting video game based on the film for Android and iOS devices, and Yuke's made a game for the PS3 and Xbox 360. An arcade game was also released by ICE (Innovative Concepts in Entertainment). The film was released on DVD, Blu-ray, and both high-definition and standard-definition digital download on January 24, 2012, from Touchstone Home Entertainment. Additional material includes Disney Second Screen; deleted and extended scenes with introductions by director Levy; and a profile of film consultant Sugar Ray Leonard. Real Steel earned $85,468,508 in North America, and $213,800,000 in other territories, for a worldwide total of $299,268,508. It had a worldwide opening of $49.4 million. In North America, it topped the box office with $8.5 million on its opening day and $27.3 million in total on its opening weekend, claiming the number one spot, ahead of the other new nationwide release (The Ides of March) and all holdovers. It managed first-place debuts in 11 countries including Hugh Jackman's native Australia ($4.2 million). Real Steel received mixed reviews from critics. Review aggregation website Rotten Tomatoes gives a rating of 60% based on reviews from 227 critics, with a rating average of 5.9/10. The website's consensus is, "Silly premise notwithstanding, this is a well-made Hollywood movie: Thrilling and exciting action with just enough characterization." Metacritic, which assigns a weighted average score out of 100 to reviews from mainstream critics, gives the film a rating score of 56, based on 34 reviews. Audiences surveyed by CinemaScore during the opening weekend gave the film a grade A, on a scale from A plus to F.
Roger Ebert of the Chicago Sun-Times rated the film 3 stars out of 4, saying, "Real Steel is a real movie. It has characters, it matters who they are, it makes sense of its action, it has a compelling plot. Sometimes you go into a movie with low expectations and are pleasantly surprised." Lisa Schwarzbaum of Entertainment Weekly gave the film an A-, saying director Levy "makes good use of his specialized skill in blending people and computer-made imaginary things into one lively, emotionally satisfying story". Claudia Puig of USA Today said, "Though the premise of fighting robots does seem a plausible and intriguing extension of the contemporary WWE world, Real Steel is hampered by leaden, clichéd moments in which a stubborn boy teaches his childish father a valuable lesson." James White of the UK magazine Empire gave the film 3 of 5 stars, saying, "Rocky with robots? It's not quite in Balboa's weight class, but Real Steel at least has some heft. There's barely a story beat among the beat-downs that you won't expect, and sometimes the saccharine gets in the way of the spectacle, but on the whole this is enjoyable family entertainment." Real Steel's soundtrack consists of 13 tracks featuring artists including Tom Morello, Eminem, Royce da 5'9" (Bad Meets Evil), Yelawolf, 50 Cent, Limp Bizkit and Foo Fighters. Levy, a fan of The Crystal Method, invited that duo to contribute to the soundtrack; they recorded two new songs for it after viewing a rough cut of the film. The score album, "Real Steel: Original Motion Picture Score", consists of 19 tracks composed by Danny Elfman, and was released on November 1, 2011, in the US. Levy considered Elfman one of the few composers who could do a score similar to that of the Rocky franchise, alternating guitar-based ambient music and songs with a full orchestra. All music composed by Danny Elfman. Raging Bender from the second season of Futurama also depicts a hidden human controller of a robotic boxer. ^ "Real Steel". British Board of Film Classification. August 4, 2011. Retrieved September 26, 2011. ^ a b Kaufman, Amy (October 6, 2011). "Movie Projector: 'Real Steel' to crush 'Ides of March'". Los Angeles Times. Retrieved October 7, 2011. ^ a b "Real Steel (2011)". Box Office Mojo. IMDB. Retrieved November 16, 2011. ^ DiOrio, Carl (December 9, 2009). "Touchstone sets 'Real Steel' release for 2011". The Hollywood Reporter. Retrieved July 19, 2015. ^ a b c d Siegel, Tatiana; Graser, Marc (November 23, 2009). "Hugh Jackman to star in 'Real Steel'". Variety. Archived from the original on June 29, 2011. Retrieved September 14, 2011. ^ a b c Fernandez, Jay A.; Kit, Borys (September 15, 2009). "Shawn Levy is new man of 'Steel'". The Hollywood Reporter. Archived from the original on September 14, 2011. Retrieved September 14, 2011. ^ Fleming, Michael (September 15, 2009). "Levy in for 'bots of 'Steel'". Variety. Archived from the original on June 29, 2011. Retrieved September 14, 2011. ^ "Hollywood's Top 40". Vanity Fair. March 2011. Archived from the original on July 5, 2011. Retrieved October 3, 2011. ^ Fleming, Michael (September 30, 2009). "Hugh Jackman boxed in for Levy". Variety. Archived from the original on June 29, 2011. Retrieved September 14, 2011. ^ a b Breznican, Anthony (June 15, 2010). "In Hugh Jackman's 'Real Steel,' the robot titans go pugilistic". USA Today. Archived from the original on September 14, 2011. Retrieved September 14, 2011. ^ a b McClintock, Pamela (March 15, 2010). "Goyo added to Levy's 'Steel'". Variety. Archived from the original on June 29, 2011. Retrieved September 14, 2011. ^ Hinds, Julie (October 15, 2010). "Michigan movie clips". Detroit Free Press: C1. Archived from the original on September 14, 2011. Retrieved September 14, 2011. . Abstract only: "Filming has concluded here on 'Real Steel,' 'Transformers 3,' 'Scream 4' and many other productions that made metro Detroit and nearby regions seem like Hollywood Midwest for the past few months". ^ "Hugh Jackman to Film Real Steel in Michigan". ComingSoon.net. January 22, 2010. Archived from the original on July 23, 2011. Retrieved February 14, 2011. Cited to unavailable Detroit Free Press article, ""Hugh Jackman Coming to Michigan to Star in Big-Budget Sci-Fi Movie", January 22, 2010. ^ Hinds, Julie (October 1, 2011). "Michigan locations in 'Real Steel'". Detroit Free Press. Archived from the original on October 4, 2011. Retrieved October 4, 2011. ^ Worley, Rob M. (September 13, 2011). "Bringing Real Steel's Robots To Life". ComicBookResources.com. Retrieved September 28, 2011. ^ Lovece, Frank (September 29, 2011). "Robots in the ring: Shawn Levy and Anthony Mackie bet on 'Real Steel'". Film Journal International. Archived from the original on October 5, 2011. Retrieved October 4, 2011. ^ Staff (September 6, 2011). "'Real Steel' Paris Premiere At Le Grand Rex". Life. ^ Ford, Rebecca (October 2, 2011). "Hugh Jackman, Evangeline Lilly Attend 'Real Steel' Premiere". The Hollywood Reporter. Archived from the original on October 4, 2011. Retrieved October 4, 2011. ^ Staff (September 21, 2011). "Jackman a big hit at wrestling show". Sydney Morning Herald. ^ Debruge, Peter (September 28, 2011). "Review: 'Real Steel'". Variety. ^ McClintock, Pamela (October 13, 2010). "DreamWorks' holiday 'War Horse'". Variety. Archived from the original on June 29, 2011. Retrieved September 15, 2011. ^ "Release Schedule". Box Office Mojo. Retrieved October 3, 2011. ^ Vlessing, Etan (October 3, 2011). "Imax To Show 'Real Steel' on 270 Domestic Screens". The Hollywood Reporter. Archived from the original on October 4, 2011. Retrieved October 4, 2011. ^ "Film trailer: 'Real Steel' starring Hugh Jackman". The Independent. December 10, 2010. Archived from the original on September 14, 2011. Retrieved September 14, 2011. ^ Breznican, Anthony (May 10, 2011). "'Real Steel' trailer: Hugh Jackman and director Shawn Levy discuss the human element in their robo-boxing movie". Entertainment Weekly. Archived from the original on September 14, 2011. Retrieved September 14, 2011. ^ Graser, Marc (May 26, 2011). "Pic promos get physical". Variety. Archived from the original on September 15, 2011. Retrieved September 15, 2011. ^ Fernandez, Sofia M. (September 23, 2011). "Hugh Jackman Unveils 'Real Steel' Airplane". The Hollywood Reporter. ^ Miller, Julie (September 20, 2011). "VIDEO: Hugh Jackman, WWE Stars Spend 6+ Uncomfortable Minutes in the Ring". Movieline. Archived from the original on September 26, 2011. Retrieved September 27, 2011. ^ "Real Steel Movie Playsets and Role Playing Games". PaperBlog.com. November 3, 2011. Retrieved November 27, 2011. ^ Staff (September 23, 2011). "Jump Games releases Real Steel fighting game for Android and iOS". ThinkDigit.com. Nine Dot Nine Mediaworx Pvt. Ltd. Retrieved October 3, 2011. ^ "Real Steel Video Game official website". Retrieved January 27, 2014. ^ "Real Steel Blu-ray Release Date, Details and Cover Art". The HD Room. December 2, 2011. Retrieved December 2, 2011. ^ "Real Steel Hitting DVD and Blu-ray in January". Filmonic. December 2, 2011. Retrieved December 2, 2011. ^ McClintock, Pamela (October 9, 2011). "Box Office Report: Hugh Jackman Starrer 'Real Steel' Wins Weekend with $27.3 Mil". Retrieved October 11, 2011. ^ "October 7–9, 2011 Weekend". Retrieved October 18, 2011. ^ "Real Steel". Retrieved October 14, 2011. ^ "Real Steel (2011)". Rotten Tomatoes. Fandango. Retrieved October 9, 2011. ^ "Real Steel: Reviews (2011)". Metacritic. CNET Networks. Retrieved October 9, 2011. ^ Kaufman, Amy (October 9, 2011). "Box Office: 'Real Steel' KOs competition, including George Clooney". Los Angeles Times. Retrieved October 9, 2011. ^ Ebert, Roger (October 5, 2011). "Real Steel Review". Chicago Sun-Times. Retrieved October 9, 2011. ^ Schwarzbaum, Lisa (October 13, 2011). "Real Steel (2011)". Entertainment Weekly. ^ Puig, Claudia (October 7, 2011). "'Real Steel' robots do battle with movie cliches". USA Today. Retrieved October 12, 2011. ^ White, James (n.d.). "Real Steel". Empire. ^ "33rd Annual Young Artist Awards". YoungArtistAwards.org. Retrieved May 6, 2012. ^ "Real Steel - Music From The Motion Picture". Amazon.com. Retrieved July 28, 2012. ^ "Real Steel". Amazon.com. Retrieved July 28, 2012. Wikimedia Commons has media related to Real Steel.